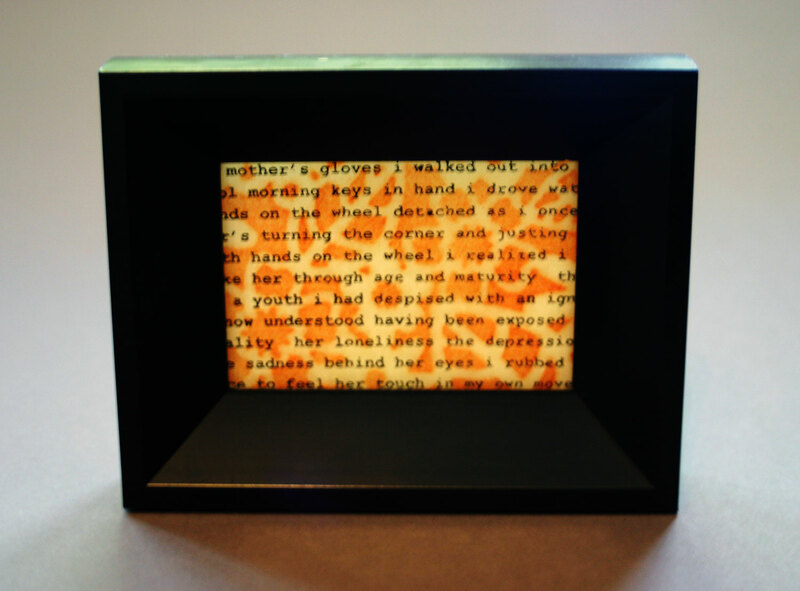 Understanding Ana is comprised of two pieces of glass each 8.5cm x 6cm x 3mm in size. 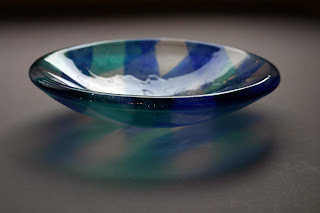 Each piece of glass a separate idea inspired by two very different memories of my mother. These are not new ideas. They are concepts I have already been using in other pieces but they come together here in a new way for me. For example, the background piece of glass includes a floral pattern symbolic of both my mothers passion for gardening and her fine filigree crochet work. This is representative of my mother's creative side. 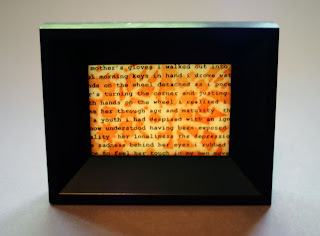 I began using imagery inspired by my mothers crochet when asked to do a piece for the SAVA Gallery show the Art of Family which opened in May of 2009. Since then these images have continued to show up in pieces like My Mother's Garden and some clear glass functional work. In Understanding Ana this imagery is hidden behind a layer of clear glass. 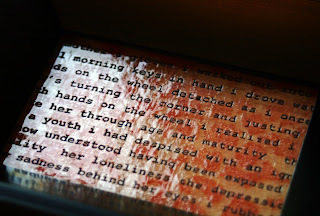 The texture of the granular imagery visible but not accessible to the touch. The foreground layer of clear glass contains a random segment of text taken from a piece of prose I wrote after driving to work on a cold winter morning. The text was carved from the glass using sandblasting techniques and back-filled with black enamel before firing. It was written after a moment of epiphany. For the first time I felt I really understood a certain aspect of my mother, her sadness. For that moment I could truly empathize. 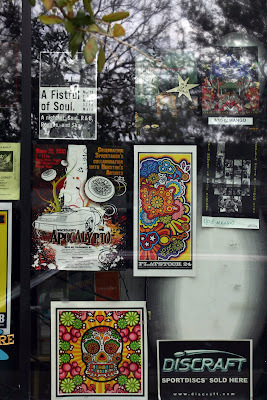 On the glass the words are run together, no capitalization, no punctuation, no intention that they be fully read or understood. So for your benefit the original text is below. The completed piece brings together the pretty picture in the background with the cold mechanical type scaring the surface much like reality. Together I hope they make something beautiful here just as these conditions can in us. 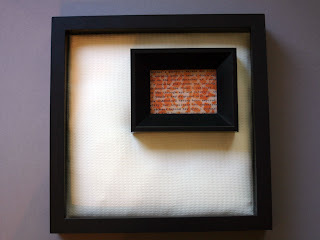 Because of its' small size in order for it to be displayed as part of the San Antonio Calligraphy Guild's (SACG) Spring Show, I framed the completed framed piece. 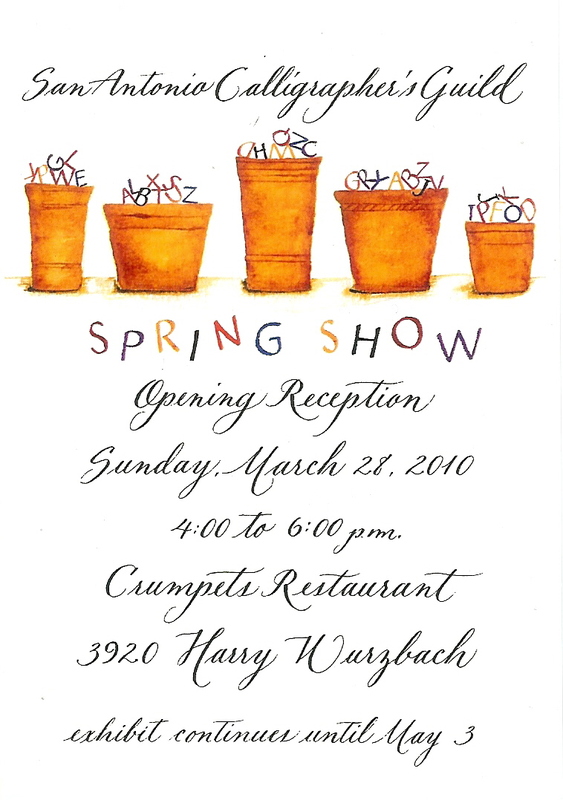 You can see this along with the works of other members of the SACG on display at Crumpets Restaurant. 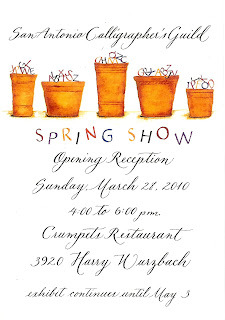 The opening reception is today from 4:00 to 6:00 Pm and the work will be on display through May 3rd of 2010. I really should be loading the kilns, which tonight would mean first scrapping and priming the shelves. 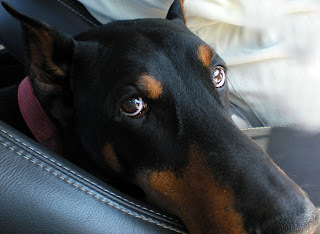 But having already spent the day away from home I am having a hard time not succumbing to the sad puppy dog eyes that keep saying “pet my head, pet my head”. Who would not surrender to this gentle giants request for a little affection. After all isn’t that what we all want, a little love. 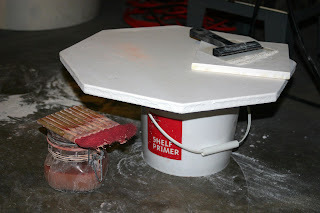 Besides the alternative, scraping and priming kiln shelves, will still be there tomorrow. 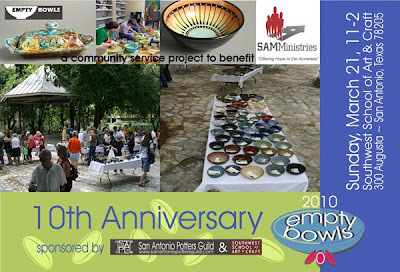 I am excited to participate in the San Antonio Potter Guild's 10th Annual Empty Bowls event to benefit SAMMisistries. For $18 guests may select a bowl crafted by a local artisan along with a serving of soup and bread donated by local restaurants. The event also includes a silent auction with work from various local artists. The word is out. 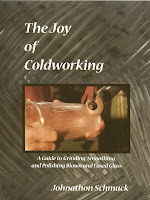 Johnathon Schmuck, author of The Joy of Coldworking , will be returning to San Antonio, Texas to teach beginning and intermediate workshops in coldworking techniques at Wired Designs Studio. Johnathon is a wealth of knowledge and experience. 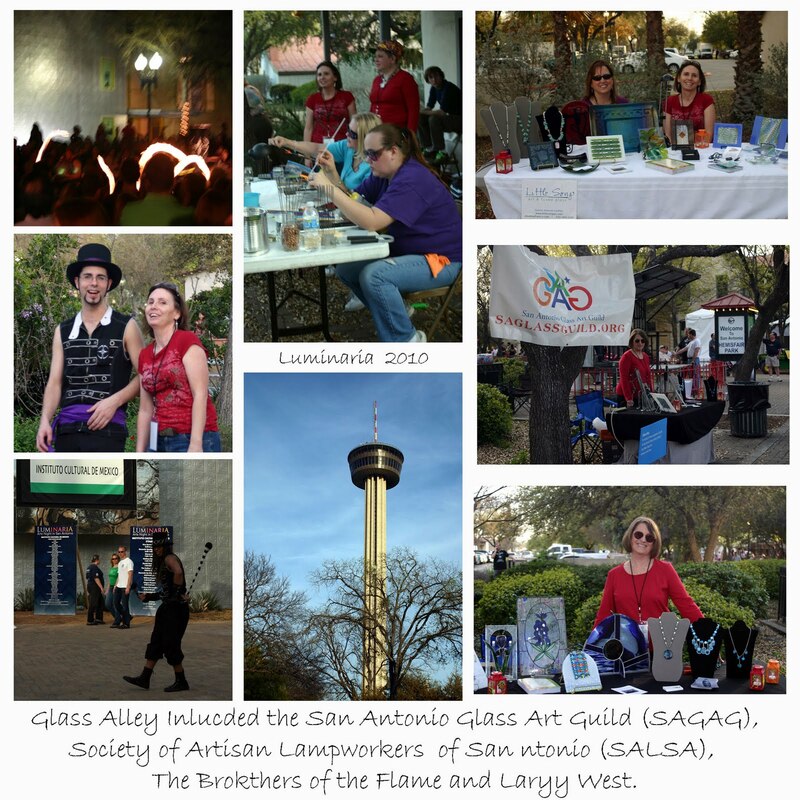 The skills taught in these workshops are necessary to any craftsman who wants to produce quality glass work. This workshop will start by introducing each of the cold shop tools (e.g. diamond saw, sandblaster, lap grinder, and belt sander), what they do, how to use them safely, and why they are important. Students will also learn about the multitude of hand lapping applications. During these two days you could gain the skills to make you successful at the most essential cold working applications. A two day of intensive with lectures, demos, and a lot of working time. Explore lathe working with diamond wheels, air-powered hand grinders, multi-stage sandblasting, and the subtleties of matte finishes achieved manually and chemically. Join the beginning, intermediate or both sessions, with "the guy who wrote the book on Coldworking !" You can bet you will find me in the studio every chance I get during these four days. Thanks to the generous donation of one our the San Antonio Calligraphy Guild (SACG) members our library has recently acquired ten new books. It has been my privilege to assist in cataloging the SACG library online. With this responsibility comes the opportunity to briefly peruse these new acquisitions just before they become available to be checked out by our members. 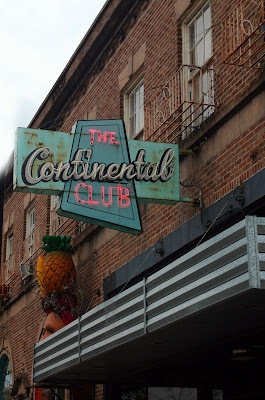 I thought I would highlights a few of the newest additions here for you. Illuminating the Word The Making of the Saint John's Bible by Christopher Calderhead is a stunning history of the creation of this modern masterpiece. The book details this project from conception through completion including information on the materials used, scribes who participated and techniques they used. It is a beautiful record of this historic undertaking. The Illuminated Alphabet with calligraphy by Timothy Noad and Text by Patricia Seligman is both lovely to look at and informative. I was not ready to part with this book and had to ordered a copy of this for my own library. Calligraphic Lettering with Wide pen & Brush by Ralph Douglass a classic resource first published in 1949 has been reprinted numerous times in the past 6 decades, and for good reason. This book has been so widely published that it is easy to locate a copy either new or used. The SACG Library has a copy of this book published in 1967 and one published in 1975. Celtic Designs and Ornament for Calligraphers is a fabulous resource to understanding the composition and arrangement of Celtic works such as the Book of Kells, the Book of Darrow and other 7th-9th century manuscripts. Mathematical in nature I found this book's clear demonstrates of the geometric principles used to determine page layout and design placement fascinating. These and the other six new acquisitions to the SACG library will be available at tonight 's general meeting to be checked out by SACG members. On a last minute visits to the Bullseye Glass Resource Center in Portland Oregon, before returning home from BECON in June of 2009, I picked up a book by Kevin Petrie. I was facing the long plane ride home and had already exhausted my reading material. I needed something to entertain and this Glass And Print handbook looked fascinating. An absolutely fabulous resource it is both a wealth of information and a truly enjoyable read. The book includes case studies and historical information in equal balance to the discussion of printing techniques used on glass. This was the perfect book to pass the time on my flight home and one I would be able to pull back off the shelf for information later. And pull it back off the shelf I did, right after a three day workshop with Susan Taylor Glasgow at Wired Designs Studio. 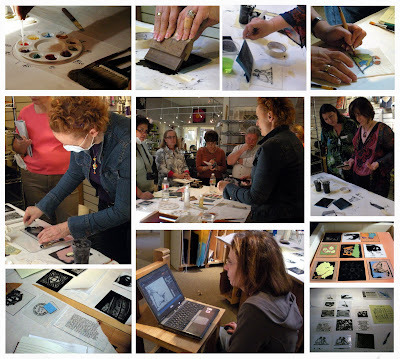 During the workshop we learned to apply images and text onto glass using screen printing and photo realistic sandblasting techniques. With my eyes wide open I reached back to this book with a whole new perspective. It was even better the second and third time around. As I consider how I will incorporate these techniques into my work, I know that along with my detailed notes from class the Glass And Print Glass Handbook will be a valuable tool.